The Performers’ Rights Regime: The Sri Lankan Vocalists’ Solution or Their Concern? The distinctive situation in the Sri Lankan music industry, along with its creative hierarchy, seems to have made the task of resolving its vocalists’ issues through the introduction of a PRR a significantly difficult one. The vocalists’ concerns in Sri Lanka revolve around two main themes: belonging and remuneration. This chapter examines whether the PRR is able to address the vocalists’ remuneration concern through royalty collection schemes. In that regard, the chapter will explore the functioning of royalty collection schemes in three music industries in the world, UK, USA and India in order to determine whether such schemes have the potential to resolve the Sinhala vocalists’ remuneration concern. 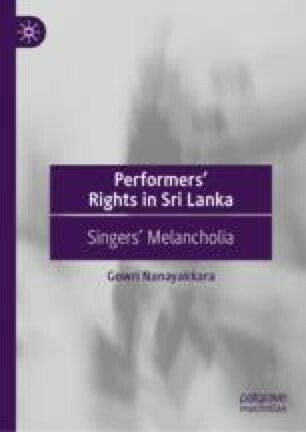 An earlier version of this chapter was published as G Nanayakkara, ‘Promise and Perils of Sri Lankan Performers’ Rights: The Royalty Collection in Music’ (2017) 23(1) European Journal of Current Legal Issues. Ajwani, D, ‘Unequal Music: Singers Demand Royalty but May Have to Take a Cut in Upfront Payment for Each Song’ (Forbes India, India, 4 November 2009) http://business.in.com/article/resolution/unequal-music/6242/1#ixzz1ZuGz1g2R. Cooke, C, ‘All-New Music Modernisation Act Glues Together American Music Proposals’ http://www.completemusicupdate.com/article/all-new-music-modernization-act-glues-together-american-music-proposals/. Deshpande, Priyankka, ‘Music Rights Body Pauses Party Organisers’ Paylists’ (Midday Metro, Delhi, 30 December 2013) http://www.mid-day.com/articles/music-rights-body-pauses-party-organisers-playlists/246485. IPRS v Aditya Pande and Others FAO (OS) No. 423-424/2011 High Court, Delhi https://indiankanoon.org/doc/85777093/. Iyer, Anita, ‘Singers Assure a Transparent Royalty Collection Body’ (19 July 2013) http://www.soundbox.co.in/singers-assure-a-transparent-royalty-collection-body/. Iyer, M, ‘Lata Asha Appeal to Govt for Performers’ Royalty’ (The Times of India, Mumbai, 17 September 2009) https://timesofindia.indiatimes.com/city/mumbai/Lata-Asha-appeal-to-govt-for-performers-royalty/articleshow/5020113.cms. Krishnamurthy, Nikhil, ‘Indian Copyright Collecting Societies and Foreign Royalties: Whither Transparency?’ (Spicy IP, 18 November 2008) https://spicyip.com/2008/11/indian-copyright-collecting-societies.html. Lalwani, V, ‘Discordant Notes’ (Mumbai Mirror, Mumbai, 25 December 2013) https://mumbaimirror.indiatimes.com/entertainment/bollywood/articleshow/27872087.cms. Music Broadcast Pvt Ltd v Indian Performing Right Society (25 July 2011) Mumbai High Court Mathrubhumy Printing and Publishing v the IPRS FAO. No. 82 of 2009 (8 February 2011) High Court, Kerala http://www.indiankanoon.org/doc/976185/. Parisi, P, ‘Music Modernisation Act Unanimously Passes House of Representatives’ https://variety.com/2018/biz/news/music-modernization-act-unanimously-passes-house-of-representatives-1202787045/. Reddy, P, ‘Music Labels Across India Complain Against PPL’s Anti-competitive Behaviour’ (Spicy IP, 29 December 2011) http://spicyipindia.blogpost/ch/2011/12/music-labels-across-india.html. Saikia, N, ‘New Film and Music Royalties Under the 2012 Copyright Act’ http://copyright.lawmatters.in/2012/05/new-film-and-music-royalties-under-2012.html. Sanchez, D, ‘What Streaming Music Services Pay’ (Update for 2018) https://www.digitalmusicnews.com/2018/01/16/streaming-music-services-pay-2018/. Shree, P, ‘Supreme Court Re-affirmes: No Royalty for Lyricists and Music Composers’ https://selvams.com/blog/supreme-court-re-affirms-no-royalty-lyricist-music-composers/.